Arianespace continues the momentum for O3b Networks, and sets new operational benchmarks on its latest Soyuz success. 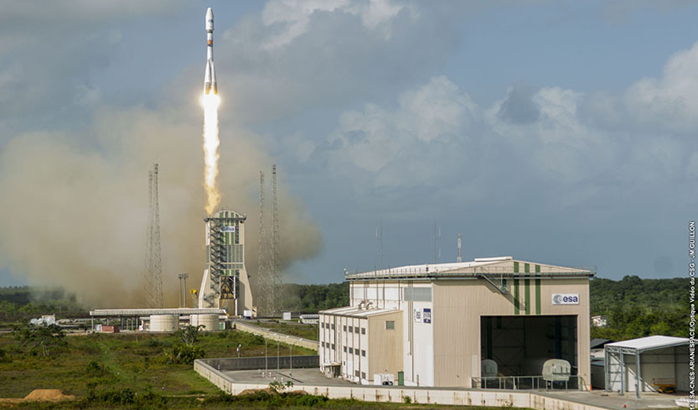 Today’s medium-lift Soyuz mission, which deployed the next four satellites for O3b Networks’ pioneering connectivity service on a flight performed from the Spaceport in French Guiana, wrapped up an historic 12 months of commercial launch services for Arianespace. Arianespace’s workhorse Soyuz is shown lifting off from the Spaceport’s ELS launch facility during the daytime launch with four more connectivity satellites for O3b Networks. The 2-hr., 22-min. flight began with the propulsion of Soyuz’ basic three-stage launch vehicle, and was followed by multiple burns of its Fregat upper stage. O3b Networks’ four satellites were released in two phases from a dispenser system atop the Fregat stage. 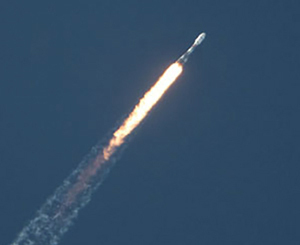 This launch success – which had a total payload lift performance of more than 3,180 kg. – continues the strong partnership between Arianespace and O3b Networks. It follows Arianespace Soyuz missions in July 2014 and June 2013 that orbited the customer’s first eight spacecraft in batches of four each – enabling O3b Networks to become fully operational. With its roll-out of services on a global basis in September 2014, O3b Networks offers a system that combines the reach of satellite with the speed of fiber – providing customers with affordable, low latency, high bandwidth connectivity. The constellation is fully scalable to meet market demand and operates from a medium-orbit altitude of 8,062 km., with O3b’s spacecraft all designed, integrated and tested by Thales Alenia Space. The afternoon launch provided an excellent view of Arianespace’s medium-lift Soyuz as it departed French Guiana on today’s year-ending mission. Today’s success was of particular significance for Arianespace, as the four spacecraft lofted by Soyuz today surpassed the 500-satellite-launched milestone since the company’s creation in 1980. Over the past 12 months, Arianespace carried out 11 launches and orbited 23 satellites from the Spaceport using 6 heavy-lift Ariane 5s, 4 Soyuz and one Vega light-lift vehicle – a new milestone since the introduction of this full launcher family at French Guiana. Individual records broken during this activity included the largest payload mass delivered to geostationary transfer orbit (10.3 metric tons on Ariane 5’s February 6 mission with ABS-2 and Athena-Fidus); the heaviest payload ever launched by Europe (ATV Georges Lemaître, lofted by Ariane 5 on July 29); and a new cumulative payload lift performance for a single year (75 tons).